A World of Speculation: Was It a Suicide Bomb? Do bus drivers in London not know their way around their own routes? Or was the bomber driving the bus? 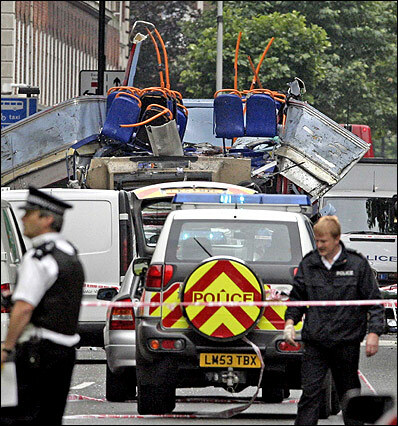 At Tavistock Square, a parking attendant, Ade Soji, said the driver of the bus that exploded had stopped him just before it took place. "I was helping a member of the public with directions when the bus stopped and the driver asked me the name of the street," Mr. Soji told the Press Association. "I told him Tavistock Square and he called me over. Just as I was about to go, I heard the bus explode. In another second I would have been dead. I had to run for my life."